Daniels Sheet Metal specializes in sheet metal fabrication and gutters in Mobile and all of Baldwin County. We produce and fabricate a large range of metal products from all types of copper and aluminum to light gauge stainless steel fabrications. 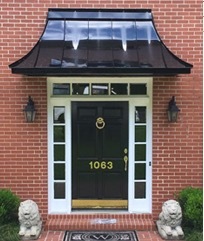 A few of our products include: seamless gutters, half round gutters and downspouts, aluminum and copper awnings, decorative vent hoods, cupolas and dormers. Daniels Sheet Metal offers residental and commercial gutter repair and gutter installation. For a fuller overview of our custom metal fabrication, please give us a call or browse our Sheet Metal Fabrication products. Our sheet metal specialists have served the Mobile, Baldwin County and surrounding areas for over thirty years. Through the decades, our company has developed and expanded, but our mission has remained the same: to offer fast, friendly service delivered with integrity and the highest standards of quality. Daniels Sheet Metal has serviced the commercial and residential Gulf Coast area since 1974. If your residential home needs gutter repair or upgrades to seamless gutters, we can help! While some companies try to do it all, we focus on doing one thing and we do it right... Sheet Metal Fabrication! We're happy to help. We'll visit your property and take all of the necessary measurements to provide you an accurate quote whether it's sheet metal fabrication or gutters. To schedule your appointment, give us a call. Or, you're welcome to submit your request online. We are proud to serve Mobile, Alabama and the surrounding Gulf Coast area for all of their sheet metal fabrication and everything gutters.